If I have learned one thing about the creative process, it is that pushing boundaries is incredibly important. 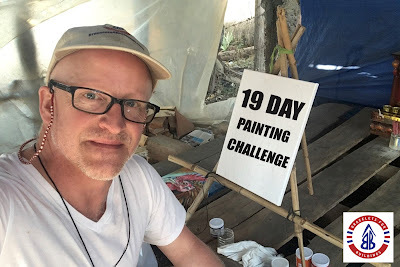 Over the years, I've done a variety of different things to push myself to grow as an artist, including painting under a family's temporary shelter in the 40-degree heat of Cambodia's dry season a few weeks ago. All proceeds from the sale of these paintings paid for the house we built a few weeks ago for Tea and Mapp and their three children. One of the prompts during last year's challenge was "Someone who inspired you recently", or something similar. I chose Chat Tom, the father of one of 2017's home recipient families. We were able to present him with a fine art print of his portrait as he was walking down the dusty village road. We then dropped by his house to reconnect with the rest of the family. "The Monk's Blessing", "Tesla", "Chief Sitting Bull", and "James Hetfield" also turned out to be very popular sellers (as gallery canvas prints) last year. Now that we're back from our second visit to Cambodia, I am feeling the need to stretch my creative muscles once again and begin fundraising efforts for our 2020 building season with B4B. It makes sense to take an idea that produced tremendous and unexpected results last year and do it again, with two little twists. 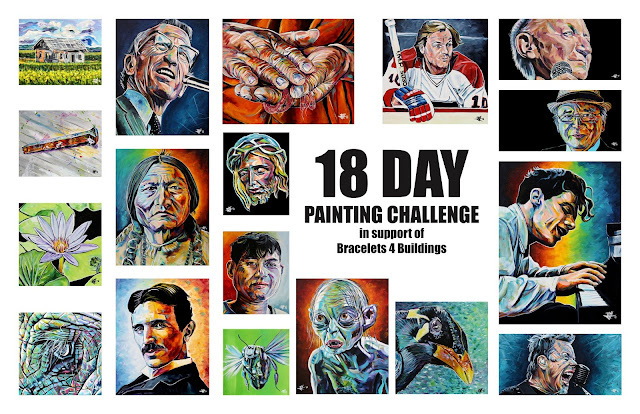 First, it makes sense to grow this creative exercise and fundraiser to the 19 DAY PAINTING CHALLENGE. It will officially start on Monday, February 18th and go until Friday, March 8th. All the paintings produced will be available for purchase with sale proceeds being donated by our family to Bracelets For Buildings. The second twist is that in addition to subject prompt suggestions, I'd be open to "dare" suggestions: "I dare you to paint with only a spoon", or "I dare you to paint with only black and white", etc. I'm excited to see what emerges during the 19 DAY PAINTING CHALLENGE. It will feel great to get a jump on the fundraising to help another amazing family overseas.